I have been thinking about our modern calendar a lot lately. It just does not really make sense to me. According to this calendar winter, spring, summer and autumn start at the respective solstices and equinoxes, but shouldn’t they be the centers of these seasons and not the beginnings? Shouldn’t the darkest day of the year be the middle of winter and not the beginning of it? If it was the beginning it means that the first month of winter is basically equal to the last one of autumn which doesn’t make sense at all, because winter is supposed to be darker/colder than Autumn. Now it appears, that the answer to these questions is this: This modern calender does not orientate after the strength of the sun or the length of the days, but after the temperature. And it turns out, that the Ocean saves much of the coldness of winter and of the heat of summer and stays this warm/cold much longer than the air does and it actually also gives much of this heat/coldness back to the air after the air has already lost it. This means that the further you live near an Ocean the later it gets cold in winter and the later it gets warm in summer. This is the reason why the modern calendar simply pushes the seasons 1.5 months into the future. This might seem logical at first glance, but in my opinion it isn’t. How can we simply say that this delay in temperatur is exactly 1.5 months? Or how can we say that is everywhere 1.5 months? Remember, the further you live at an Ocean, the stronger is this effect. And even if it would everywhere be exactly 1.5 months, wouldn’t it still be odd to only orientate after temperature? The sun is still most powerful and the days are still the longest at the end of June and not at the beginning of August, even if the latter is usually hotter. It’s only hotter though, because of the heat saved by the ocean at the end of June and relaesed at the beginning of August. 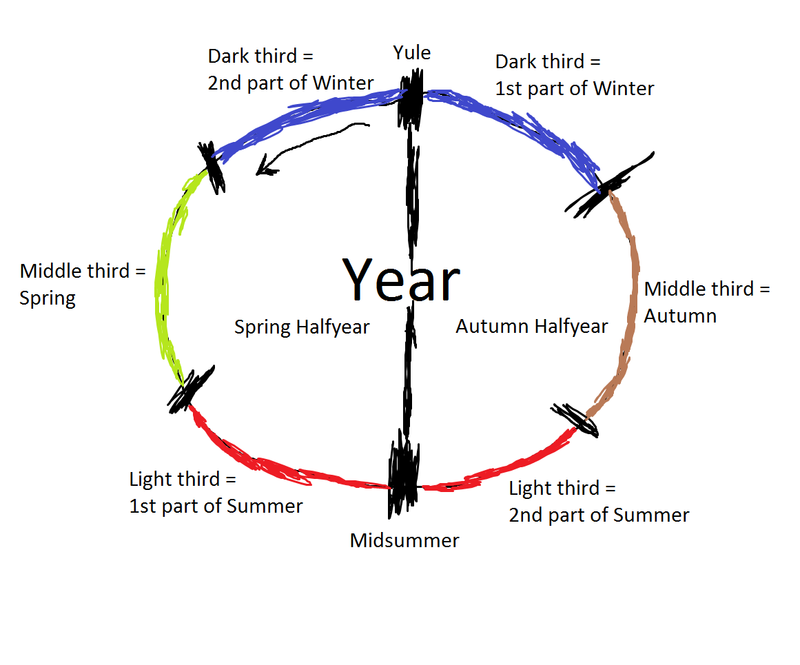 So the year would basically consist of six parts and if we divided these parts (which would appear perfectly natural, since spring and autumn are already divided by the equinoxes), we would get exactly twelve months, which would roughly represent the ones of the modern calendar (only they would start and end about one week earlier, with the wintersolstice/yule/christmass as end of December for example). My father told me, that his grandmother used to say, that you can walk barefoot in months without an R in them (i. e. May, June, July, August, which would be exactly the four summer months of my calendar). Further the seasons would represent the times of a day: Winter is the night (20:00 – 4:00), spring is the morning (4:00 – 8:00), summer is the day (i. e. forenoon and afternoon, 8:00 – 16:00) and autumn is the evening (16:00 – 20:00). This would also very well fit the ancient units of meassurement, introduced in Varg Vikernes’ book MYFAROG. If a year represents a day in the way I just described, then each of the thirds of a halfyear would represent a shift (4 hours) and every week would roughly represent a glass (half an hour). I also know the Scandinavian Bronze Age calendar with 13 months of 28 days, known from a rock carving in Bohuslän and introduced by Varg Vikernes in his book Sorcery and Religion in Ancient Scandinavia as well as in MYFAROG, but I don’t think that this was the only calendar used in the ancient times and I am sure that this one was used too, simply because it would be so logical to do so (as explained above). In any case it would be a really logical explaination, why we have exactly twelve months as well as 12/24 hours and also why the number 12 in generell was pretty important in the past. By the way, according to my calendar, summer will end this Saturday (22nd August) around midday. I wish everyone a good start into autumn! Heill Máni, the god of autumn! With this post I just want to share a very interesting 2 hour long german lecture about vaccines by Anita Petek Dimmer. I absolutely approve this quote and I will explain why. There are uncountable theories on how malevolent vaccines are to the human body and probably also uncountable theories claiming they are good. I won’t deal with neither of those theories here though, because in my opinion common sense is already enough to be against vaccines. What does vaccinating do according to the people who are pro vaccines? It protects you from getting sick. What do vaccines do according to the people who are against them? They destroy your immune system and result in the fact the you will always get sick. If I cannot cope with a simple sicknes without being vaccinated, I do not want to cope with it, because nature has not programmed me to do so. If I did it anyway (through vaccines), I will only pass on my bad genes and harm my futre children.